Little known in Canada outside a small circle of aficionados, Enki Bilal is probably one of the most imaginative, talented graphic novelists alive. He is also a controversial, misunderstood figure whose work addresses deeply historical questions. Thus, this post offers a reflection on Bilal’s career and, more particularly, his perspective on the past and how it constantly collides with the present and future of humankind. I will also address two contradictions in Bilal’s approach to his craft, namely that he (a) “has no real interest in … the past”, and (b) that he believes that the events of the twentieth century irrevocably discredited communism as an ideology. Indeed, a close reading of his work – whether authored in collaboration with Pierre Christin or on his own – tends to prove that a sophisticated sense of history pervades his work and that he is not as rabid an anti-communist as he thinks he is – or wants people to believe he is. Finally, an overview of Bilal’s graphic novels gives historians of the twentieth and twenty-first centuries fodder for thought, as his work (which spans the late Cold War era, the 1990s, and the post-9/11 period) does not confine itself to being a product of its time, but also constantly interrogates the past, the present, and the future. Enki Bilal was born Enes Bilalovic in Belgrade in 1951, of a Slovak mother and a Bosnian father. When Enki was nine years old, the family moved to Paris, where his father had found a new job. It was during his adolescence that the young artist developed a taste for sketching, painting, and writing stories. In 1971, he made his breakthrough in the fine arts community, by winning the comics magazine Pilote’s “new talent” prize. Four years later, Bilal met Pierre Christin, with whom he collaborated on seven full-length books. Christin, born in 1938, soon became more than a partner in crime, as he took on a mentorship role. While the division of labour between the two men was well-established from the start, with Christin as writer and Bilal as illustrator, the omnipresence of history and politics in those early works had a major influence on the artist’s solo work. A leftist, albeit fiercely independent, thinker, Christin wanted to “introduce new topics [in the comics world], take a more adult-friendly approach at a time when the profession was still very conformist.” By contrast, Bilal has stated that he was never “really part of the world, of the culture he lived in.” Soon, however, the illustrator metamorphosed into a deeply political artist. An author’s view of his/her environment changes over time. Although this may seem self-evident as far as prominent writers are concerned – one does often distinguish between the “young” and the “older” Marx, or pre- and post-Crime and Punishment Dostoevsky –, the same observation rarely seems as obvious when it comes to graphic novelists. In Bilal’s case, one should distinguish between the aesthetic aspects of his craft on the one hand and, on the other, his trajectory as a writer. Indeed, periodizing this artist’s career just by looking at his graphic style would lead one to infer that the first caesura, a “magical realist” turn of sorts, occurred sometime between the completion of The Black Order Brigade (1979) and The Carnival of Immortals (1980). The second transition, which led to a more impressionistic style, dates back to 1998, with the publication of The Dormant Beast (1998-2007). Now, if one were to focus on the ideological plane, his work is strikingly coherent. Although Christin probably contributed to shaping some of the young man’s political views – and, even more plausibly, influenced his anti-authoritarianism –, his protégé has stuck to a systematically anticlerical, environmentalist, left-utopian stance. Although he now privileges dystopian settings and periodically reiterates his admiration for Baudelaire and Lovecraft, Bilal has never delved into any kind of reactionary nostalgia. Unlike Michel Houellebecq’s declinist Submission, his dystopian worlds are either the result of humankind’s predatory hubris (Blood Rush [2009-2014]) or totalitarian or neo-feudalistic impulses (The Nikopol Trilogy [1980-1992]). Thus, Bilal belongs in the tradition of radical non-conformists such as Yevgeny Zamyatin and George Orwell. Based on the elements at hand, I would like to posit the hypothesis that there is one consistent ideological arc in his graphic novels, namely that of anarcho-communism. Given his staunch anticommunism – more of a form of anti-Stalinism, actually – Bilal will probably hire someone to quarter me alive if he ever reads this piece. However, the overall message conveyed in his books – as well as in Bunker Palace Hotel, his 1989 film directing debut – is quite close to nineteenth-century anarchist philosophy, like that of Peter Kropotkin and Élisée Reclus. More than mere surrealist, magical realist or science fiction fantasies, Bilal’s books (whether coauthored or solo) paint a bleak picture of all types of regimes and organized religions, while at the same time proposing – more or less explicitly – alternatives that promote sociopolitical models based on equality, ecological harmony, and direct democracy at the local level. Again, Christin’s influence undoubtedly set the ground for his junior’s political development. In that regard, the Legends of Today trilogy (1975-1977) offers a compelling array of violent antimilitarism, environmentalism, and anti-capitalism. In the first installment, entitled The Cruise of Lost Souls (1975), the authors briefly put themselves en abyme, as they discuss their own views on 50/22 B, a mysterious anarchist vigilante. While, to Bilal, the protagonist is “[a] mysterious being gifted with tremendous powers, a loner steeped in strangeness,” Christin sees him as “unheroic, a product of his society … a mere avatar of what is to come… an extra who is nothing but the expression of struggling social forces.” Although it would be tempting to see Christin as the mastermind behind the script, the latter quotes reveal a clear ideological (and generational) gap between the two men. On the one hand, Bilal understands 50/22 B as a rebel without any gods nor masters; on the other, Christin sees him as just another instrument of the objective forces of historical change. While Ship of Stone (1976) follows in the footsteps of its predecessor, albeit with a slightly more traditionalist streak, the final book of the trilogy is more nuanced. The Town That Didn’t Exist (1977) blends the pro-utopian dimension already present in the previous opuses with a harsh criticism of nineteenth-century-style Christian paternalism in a crisis-ridden industrial town. Nonetheless, the authors also provide a harsh critique of political divisions within the Left, especially in traditional unions, whether communist, socialist, or Christian. Even the utopian city that the denizens build, encouraged in their endeavour by the late factory owner’s socially progressive daughter, fails to satisfy some of them. To the authors, it seems that no top-down initiative, even well-intentioned ones, can possibly bring happiness. 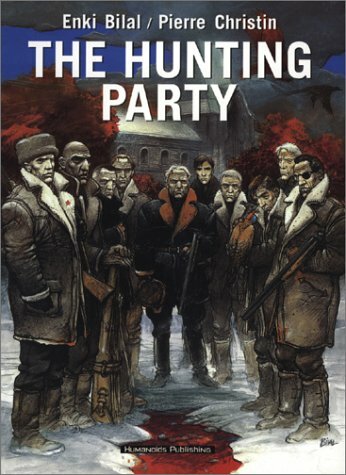 The next two books, The Black Order Brigade (1979) and The Hunting Party (1983) address the disillusionment that occurred within the communist Left in the course of the twentieth century. Both works also highlights the diversity of the Left in the late 1970s-early 1980s and how the generational dimension added to the ideological discomfort that increasingly plagued that political family. The Black Order Brigade story features eleven leftist Spanish Civil War veterans teaming up one last time, forty years after Franco’s victory, to fight their former antagonists, now involved with far-right terrorist groups. The Brigadists thus pursue their enemies throughout Europe, taking the measure of the corruption plaguing various leftist parties and realizing the vanity of their past crusades. While the authors’ sympathies clearly go to the ex-International Brigade members, each of the latter exemplifies an aspect of interwar idealism gone wrong – or rather, gone mediocre –, as the cast of characters underlines the ideological diversity present within each camp. For instance, the group includes a Danish social democrat, a Mossad agent, a Czechoslovak communist dissident, a Basque priest, and a German anarchist. The Phalanx veterans also form a motley crew, comprising members of prominent fascist or authoritarian movements of the interwar and Second World War periods. Bilal and Christin nonetheless took care to introduce a glimmer of hope in their harsh description of the Europe of the Years of Lead (http://activehistory.ca/2016/03/18529/). Two characters, namely the elusive 50/22 B (the common denominator in the duet’s first five books), and Maria Wizniewska (the only woman in the Brigadist commando) maintain a certain distance from this descent into violence. From one country to another, the Brigadists realize how entitled, bourgeois, they have become in the face of a New Left generation that ignores or does not understand them and the sacrifices they made. The story ends tragically with a somewhat cathartic battle pitting a bunch of “despicable old men” against “other old, perhaps equally despicable, men.” The conclusion is self-explanatory, as it symbolizes the bloody irony of the twentieth century and the gulf between theory and practice. But the duet’s critique of the twentieth-century Left did not end there, as Christin and Bilal engaged in extensive research on the history of the Eastern Bloc before starting work on The Hunting Party (1983). This book marks a departure from its predecessor, as the scenario is more static and small biographical flashbacks punctuate the main arc. The story takes place in a Polish country house, where members of the post-Stalinist nomenklatura and their French interpreter spend two days relaxing and going out on hunting forays in the neighbouring woods. The presence of various (fictional) high-ranking communist politicians in the dying years of Soviet-style communism in the same venue gives the authors the opportunity to provide an overview of the tragedies – deportations, massacres, betrayals – that riddled eastern and central Europe, including the Russian Civil War (1917-1922), the 1938 Stalinist purges, the Hungarian Revolution of 1956, the 1967 Polish anti-Zionist campaign (under Wladyslaw Gomulka), the 1968 repression of the Prague Spring, Ceausescu’s reign over Romania (1965-1989), and other immensely traumatic events. However, the purpose of this hunting party is not merely to reminisce on the past and shoot hares, wild boars, and bears. The real agenda consists of killing one of the guests, Sergei Šavanidze – the rising star in the Communist Party of the Soviet Union – by disguising the assassination as a hunting accident. While a certain realism marks Bilal’s work with Christin, the former’s solo work is stylistically more impressionistic and slightly less disenchanted. First of all, almost all of his books as both author and illustrator belong to the science fiction genre. Secondly, although Bilal offers a grim, dystopian vision of the future, a certain dose of humour is never absent from the stories, and the endings, albeit not always “happy”, are not devoid of optimism. That being said, many of the themes present in The Black Order Brigade and The Hunting Party pervade Bilal’s science fiction epics. For instance, colonialism, war, and racism are the central themes in the graphic short story collection entitled Memoirs from Outer Space (1978). Scathing critiques of the media, totalitarianism, neofeudalism, and “hyperliberalism” also loom large in The Nikopol Trilogy and The Dormant Beast. It is also in his solo work that Bilal developed complex female characters, like the simultaneously sensual, brainy, and disturbed journalist Jill Bioskop (The Nikopol Trilogy). In the stories co-authored with Christin, women are certainly present but usually play supporting roles. In the five novels published between 1975 and 1983, they are either sidekicks, muses, or pacifists. In The Black Order Brigades, Maria Wizniewska is the only one among the reunited Brigadists to refuse to fight, a decision that leads her to part ways with her comrades. As for the aspiring matriarch of The City that Did not Exist, she also matches, albeit in a different context, the hackneyed archetype of the altruistic, caring, woman. Hunting Party’s Nikolaevna Tretiakova, who only appears in her old lover’s memories, similarly corresponds to the “Marian” type, who sacrifices herself in vain or happens to be right before everyone else. With Jill Bioskop, Bilal departed from that model and began to develop female characters endowed with several identities and capable of as much cruelty and selfishness as their male counterparts – like the Egyptian goddess Bastet (The Carnival of Immortals), or Kim Owles, the human-dolphin hybrid (Animal’z ). When fully in control as writer and narrator, Bilal throws his readers into a seemingly chaotic, foreign future. However, it soon becomes evident that, under the postmodern veneer of intergalactic Egyptian gods meeting a Baudelaire-obsessed wayward astronaut (The Carnival of Immortals) or the reenactment of Romeo and Juliet by the unwitting survivors of a climatic catastrophe (Julia & Roem ), these dystopian tales not only warn the readers of the possibility of a dark future, but also connects them with their present and a past. The latter surely does not repeat itself, but works its way into the future in subtle brushstrokes. Thus, Paris in the year 2023 is described as a “politically autonomous, irremediably fascistic metropolis.” Global warming, entropy (in other words, loss of useful, exploitable energy), widening social divides, the ambiguous role of the media in liberal democratic and authoritarian societies, “hyperliberalism” and the return of religious and political dogmatisms: these are themes that resonated in the 1980s and 1990s, and still do in our day and age. Whether he realizes it or not, Bilal belongs in the utopian/anarcho-communist tradition. Although he has often expressed his antipathy towards Soviet-style communism, the conclusion to his latest trilogy (Blood Rush) reads like a plea for a world resembling an early nineteenth-century utopia. In addition, and despite his assertion to the contrary, his work is deeply connected with the past. Even his solo work, which unarguably belongs to the science fiction genre, is riddled with relics from twentieth-century history – e.g., Italian fascism, the 1990s Yugoslav Wars, Cold War Berlin, religious conflicts in the Middle East. In that regard, Pascal Ory’s comparison between Jacques Tardi (another seminal graphic novelist) and Bilal, whose work supposedly “focuses on the ‘futuro’” while the former’s is more concerned with “the retro,” is not completely accurate. That being said, I will be the first to concede that a historian is never truly objective, and that my own political leanings and personal trajectory certainly influenced my argument – though everything in his work points towards a connection between him and the old anti-authoritarian Left. Diacritik, “‘Le grand entretien’: Enki Bilal (et sa trilogie des éléments),” March 22, 2016, https://diacritik.com/2016/03/22/le-grand-entretien-enki-bilal-et-sa-trilogie-des-elements/, 9’43’’, 13’55’’. Unless otherwise indicated, all translations are my own. Benoît Peteers, “Entretien avec Enki Bilal et Pierre Christin,” in Fins de siècles (Casterman: Tournai, 2014), 91. Pierre Christin and Enki Bilal, La Croisière des oubliés, 6th ed. (Casterman: Tournai, 2014), 12. Ibid., Les Phalanges de l’Ordre noir, 6th ed. (Casterman: Tournai, 2014), 80. Enki Bilal, La Foire aux immortels, 6th ed. (Casterman: 2014), fake Libération front page, article by Jean-Michel Helvig, October 14, 1993, 2. Pascal Ory et al., L’art de la bande dessinée (Paris: Citadelles & Mazenod, 2012), 317.